we have been fairly busy here getting things organised for the next shipment, which is due in this week from Miami. Again, our thanks to everyone who helped. As you know by now, after monday, all food items/donations will be charged duty. 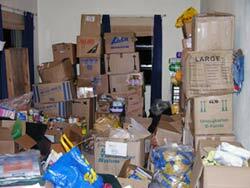 While the amount is small,about 2.5%, because the quantity of stuff coming in is quite large, this adds up quickly. Therefore, we have been making every effort to get it in duty free, and will know something definite by next week. We have also been in contact with the local Red Cross, as this is one avenue to get food in to be distributed. They have been quite helpful, and they seem willing to work with us. Also, the first shipment from Germany will be arriving on the Condor flight, on Sunday the 7th November. This should be approximately 2000 kilo of assorted relief goods from friends in Frankfurt, Stuttgart and Hamburg, and more will be arriving on subsequent flights. This week we also managed to get a load of assorted tools, hammers, saws, pliers etc, donated and will be going around and giving these out very soon. Also, we asisted with getting a good assortment of power tools donated to the T.A.Marryshow College, which was damaged by Ivan and then looted. Things are slowly improving here, but of course the services are slow to return and jobs are non-existent with the tourism industry in shambles. The electricity department is doing an exemplary job getting things sorted out, but the telephone company is dragging its feet and only slowly beginning to make repairs to the phone lines. We also had our first 2 cruise ships in the harbor. Since our last update, we have been going around to the Ministry of Finance and Red Cross to make sure that we would not have any difficulty with the shipment which would be coming in after the first of November. We were also able to get some tents from the Red Cross, to give out to people who have lost everything. 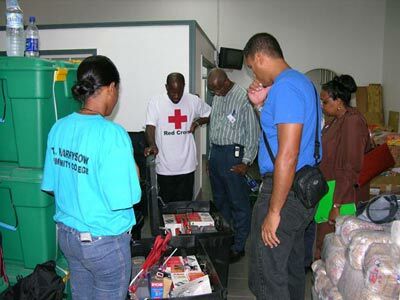 This past sunday, 7/11/04, we were at the airport to collect our first shipment from Germany, 2400 Kilograms of relief aid, which was collected by our friends in Frankfurt and Hamburg. Thanks to the help of the Grenada Red Cross, we were able to finally clear it through customs. The shipment is an assortment of clothing, food, tools etc, and monday was spent sorting and re-packaging it so that we could give it out. On tuesday we went up to Pommerose and gave out a fair amount of clothing and food and we will be returning there this saturday. We also gave out several boxes of clothing and food to two factories in the frequente area, for their workers. A heartfelt thanks goes out to everyone who contributed to this effort in Germany. The island is recovering from the effects of hurricane Ivan, with the hillsides turning green again, and the trees sprouting leaves. The cleanup continues, and an excellent job has been done by all. In the south of the island and the St.George area, things are slowly returning to a semblance of normality. Businesses are open, electricity and water have been restored to most places and there is a huge amount of repairs being done to rooftops, homes and businesses which were damaged. Further out in the rural areas, things are improving. However, there is still a pressing need for food aid in some areas as there is massive unemployment. Most cannot afford both to feed their extended families and do even basic repairs to ensure that they have a dry bed. The rainy season has continued with a vengence, and all the rain which did not fall in September, seems to want to fall from the beginning of November. . The outlook is fairly optimistic, given the fact that many people do not know where their next meal is coming from. Schools have re-opened and even those without roofs are making do as best they can until repairs can be done. this is easier said than done, since some have had their woodwork and cookery rooms looted by desperate people. We have hopes that various German organisations can be of real, and desperately needed help to two schools, but do not want to 'count our chickens'. Does anyone out there want to sponsor the re-roofing of a classroom? The northern half of the island is doing much better, especially as it did not suffer as badly as the rest from the effects of Ivan. In fact, north of Grenville and Gouyave, its business as usual. The only exception being that the nutmeg crop has been destroyed throughout the island. The government is coordinating with the farmers to start providing aid to get them back on their feet. We have received two shipments this week, one from Germany, one from Miami. We are very, very grateful to the donors: the goods are as badly needed as ever. Some of the gratitude of the recipients is moving: we have been kissed, blessed, embraced, and thanked again and again. This is the only way we can pass it on! Fortunately, the goods made it through Customs without incurring the Handling Charge, from which even the Red Cross is no longer exempt. Beacause we cannot be confident of our continued exemption, we ask all potential future donors to send money to our bank account instead of food. No shipping costs for you. No customs charges for us. 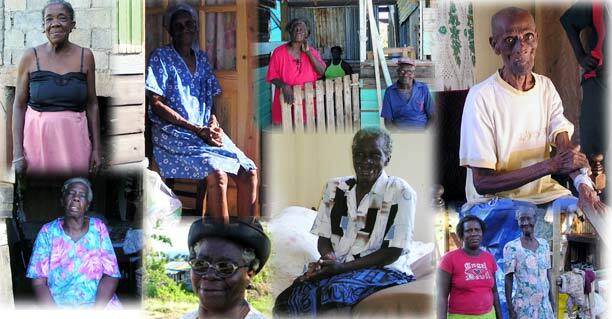 We can buy what Grenadians know, and would buy themselves. It is easier for us to show you how we have spent your money. *We are disappointed at the reluctance of porters, taxi drivers, bystanders etc. at the airport to help us move the boxes. It seems that many people in the south will not lift a finger to help their countrymen unless they are paid. And yet, unlike us, they have some income! totalling nearly ( $EC5,000) This will be a very great help. 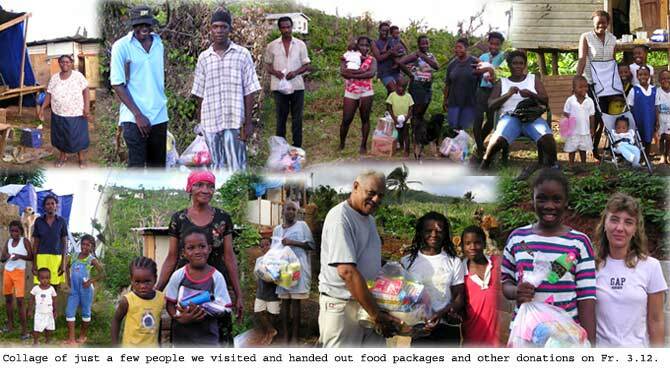 On Monday, we went to the Crochu area of St. Davids, with twenty substantial bags of food and toiletries. We distributed it mainly to elderly folk, whom we would not have found on our own: we were accompanied by a teacher from the Crochu school (currently still roofless), who led us to out-of-the-way houses. Most of these people would not have been able to walk to public food distributions and carry food away with them. (The distributions seem to have stopped.) Judge from yourselves from the pictures whether there is still a need for food aid! These people have NO income. We have decided to 'adopt' a wedge of St. David's and focus our future efforts on that area, rather than spread ourselves too thinly. For those of you that know Grenada: we will concentrate on the Apres Toute - Crochu area. Even by limiting ourselves thus, we feel that we are not doing all that is needed. 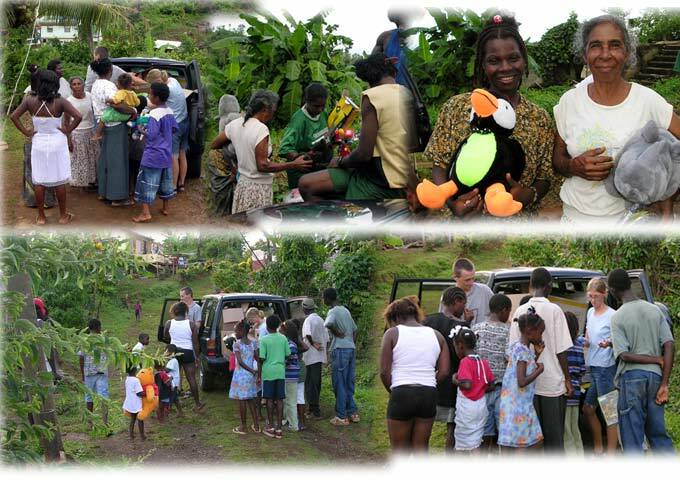 A school in Antigua is offering a school- to-school gift of individual Christmas presents. We intend to make up special Christmas packages of our own, containing some of the toys that we have been sent, and e.g. ham. We also visited the Grand Anse Medical Station who received two boxes of needed bandages and other small medical supplies. We were accompanied by George Grant, a well-known radio journalist, so that he could form his own opinion of the plight of the rural poor. It may be worth stressing that the whole of the Island is not in the same state as the areas we are taking your food to: we are looking for the most vulnerable people in the hardest-hit areas. Once again, we wished we had had far more. We met 'households' of up to thirteen, living in hastily reconstructed, tiny wood, tarpaulin and corrugated iron shacks, without a hope of electricity in the near future. One such family was living under their former house. Many were well away from the main roads, and we heard repeatedly that most had received virtually no aid (food, clothing or with housing) from the authorities. The food YOU have given is still desperately needed, and gratefully received. One grateful woman felt she had to give something back and presented me with a yam. Since the 4th, we have not had any more shipments as it is now virtually impossible to get anything through customs without having to pay the customs service charge and duty. Consequently, we have been concentrating on purchasing food here from wholesalers at a slightly reduced rate, with the cash donations we received over the past few months. We managed to put together approximately 31 substantial packages and, together with the clothing and tools which were donated, gave everything out prior to Christmas. We had also saved the children's toys, which we received prior to this, so that we could give them out for the Christmas. This was probably much more appreciated, due to the simple fact that people could not afford to buy anything for their kids, especially those badly affected by Ivan. Again, we concentrated on the St.Davids, Apres Toute area, but managed to include parts of Vincennes as well. Now, with the expected stoppage of relief to the island, we are pooling our resources and doing our best to help one community as best we can, whether it is with additional food aid or building materials. Because of this, we are asking everyone to please stop sending packages to our address in Miami, as the money needed to ship and clear these items through customs, would be better spent here helping families. Of course, any and all donations are greatly appreciated, but we are just trying our best to do the most good with what we do have on hand at the moment. Our heartfelt thanks to everyone who made all this possible. The Island's news is that electricity has now been restored to 71% of the country. Clean (drinkable) water is once again available island-wide. About half of our phone lines have been restored. 48% of (hotel) room stock is avaialble, and it is anticipated that 80% will be on stream by October. The south of the island looks truly green again: in the rainforest, at last, there is green once more. But to those who know the way we were before, it is a different green: trees are having to produce foliage from their trunks, since so many branches were ripped off. And much of the colour comes from creepers. The thick forest which was a characteristic of so much of Grenada will not be back just yet. We have decided to change from simply buying and distributing food to those on lists provided by schools. We shall still concentrate on the area of St. David's that we know best, but will be responding to people's expressed needs. We are still expecting to be asked for food, (employment has not magically reappeared) but, as fruit and vegetables come on stream again, we are expecting people's priorities to include building materials and tools. We also wish to help some of the schools who still have no cookery or woodworking matrials, which were looted after Ivan. We trust that you will think that your money is still well-spent. Feel free to tell us. Ian attended an aid co-ordinators' meeting last week. It seems that (to choose a few at randon) Oxfam is to concentrate on agricultural / forestry aid, the Red Cross on building and roofing. Various churches are handing out food. Grenadaexplorer's brief is to keep reaching the parts that the big organisations don't (always) reach. Thank you for helping us do this. 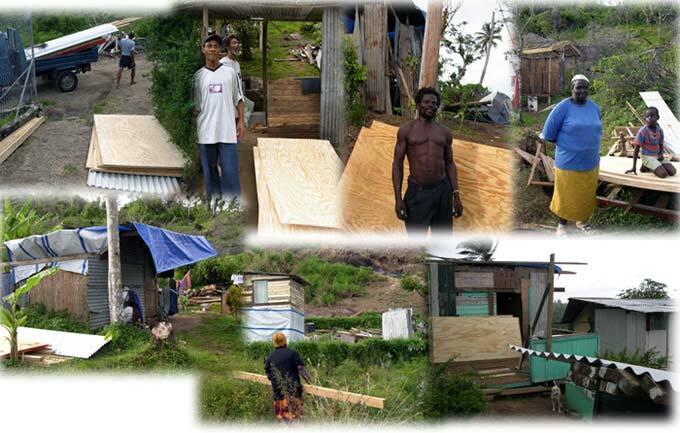 We have been fairly busy helping people with building materials, purchased with the donations we have received. We have been very careful to ensure that these people really need the assistance, and have gone out into the areas which we think were not reached as yet by the aid agencies. 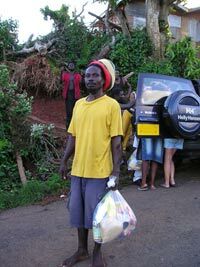 Families which we chose, were in need of basic building materials to help restore homes which were blown down. Because our funds are limited, we cannot totally rebuild homes, but have been supplying basic building materials, roofing, plywood, 2x4's for framing etc, which helps people who have not been able to properly rebuild because they cannot afford all the materials they need. Our only regret is that our funds are limited, so we can only help between 12 - 15 families. There are still many more who need help, and any assistance you should wish to give, whether it is directly to a family or to one of the aid agencies operating here, is greatly appreciated. One of the things which we have noticed is that there has been a lot of planting done, and food is no longer such a high priority. Many people have taken advantage of the fact that lots of the trees have been blown down, making it a lot easier to cultivate larger areas than previously. While the island is green again, in some areas it is not because of the trees sprouting new leaves, but because of vines taking over and trying to smother the little vegetation which is making a comeback. Hopefully, this will clear up as time goes by and nature takes its course. The tourism season is turning out to be not too bad after all, and this has helped with the unemployment problem after Ivan. Some of the aid agencies have also been offering retraining and courses in other lines of work, and many people are taking advantage of this. The great deal of re-construction on the island has also helped provide jobs, but not enough to satisfy the demand. On the whole, things are getting better and Grenadians are getting back on their feet a lot sooner than everyone thought. The island is again a valued destination, even though it is not quite as lush as before Ivan, and will not be so for a long while yet.